The No. 4 Boston University men’s hockey team was dealt a major blow before its pair of games at No. 18 Michigan University this weekend. 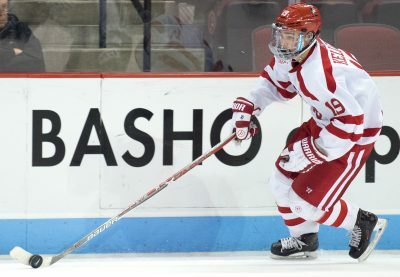 BU head coach David Quinn said Wednesday that freshman forward and leading goal-scorer Clayton Keller is “week-to-week” with a lower-body injury that he suffered in the Terriers’ (4-2-1, 1-0-1 Hockey East) 3-0 victory over Northeastern University on Saturday. In the win over the Huskies (3-3-3, 0-2-1 Hockey East), Keller was injured away from the puck early in the third period. He skated off on his own power and went down the tunnel. Though the 5-foot-10 forward made a brief reappearance on the bench, he returned to the locker room without getting back on the ice. With Keller out, Quinn said he plans on putting sophomore forward Jordan Greenway at the center position on the second line, taking Keller’s spot. Quinn will likely bring up senior forward Nick Roberto to play alongside Greenway and freshman forward Patrick Harper. Though those who were worried Keller would miss the season can breathe a sigh of relief, there are other Terriers hurting heading into the series with the Wolverines (4-3-1). Junior forward and assistant captain Nikolas Olsson is dealing with an upper body injury, but according to Quinn, should be available for Friday night’s contest. Finally, sophomore forward Ryan Cloonan is considered day-to-day, and Quinn is unsure when he’ll be ready to go. With the injuries piling up for BU, this gives some of the less-heralded guys on the team the chance to step up and contribute. Some Terriers who are traditionally on the fourth line, like freshmen forwards Johnny McDermott and Gabriel Chabot or sophomore forward Oskar Andren, will likely be given more playing time this weekend, and Quinn wants these guys to make the most of their opportunities. BU will need plenty of help against Michigan, who are coming off a 4-1 win Friday over Arizona State University. The Wolverines, who are scoring 2.8 goals per game, are led by freshman Will Lockwood, who has five goals and three assists in eight games. Defenseman Sam Piazza has also contributed on the offensive end, notching four assists. Against a dangerous team like Michigan, Quinn stressed the importance of taking care of the puck and limiting chances. The Terriers have already traveled for a pair of weekend games against a ranked opponent this season, dropping both contests to No. 2 University of Denver in October. Quinn’s squad has come a long way since then, but it will be interesting to see how BU handles the experience this time around, especially without some key players. Clayton Keller will be playing on the right side when he will be playing with the Coyotes. We should start to use him at this position when he comes back on ice from injuries. In the futur he will be playing with Dylan Strome and Lawson Crouse on the first line of the Coyotes.